Some alternative in designing a living room often is valuable to consider. Why? Some people get just bored with common or usual ideas of living room that have been too popular this time. The problem is that there are still many of us who just don’t realize it. An alternative will be simply refreshing if you want to try it. Imagine if you have a living room that has an exceptional design, which cannot be seen in any other homes. It would be something relieving as well as satisfying, wouldn’t it? 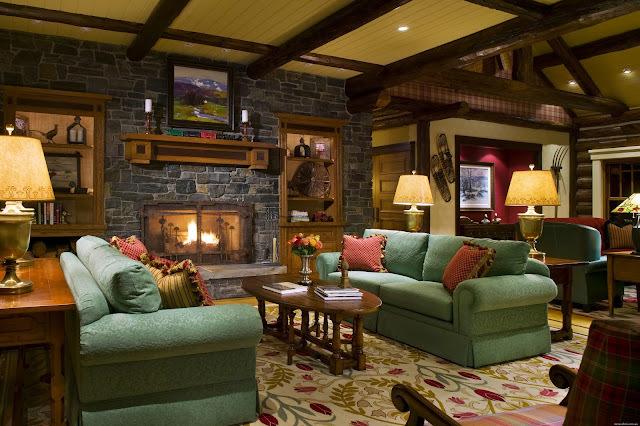 Speaking of alternatives of living room interior design ideas, I am interested to talk about rustic living room. What do you know about this living room style? A rustic living room can be explained as a style of living room that is intentionally made simple and rough in case of look. More or less, it is closely connected to the styles popular in the countryside. Charming, welcoming, cozy, and warm are 4 typical nuances of a rustic idea. Generally speaking, any living room of the rustic style commonly has a mix of nuances of charming, welcoming, cozy, and warm. Such a combination of nuances consequently leads to a situation that can be relaxing and comfortable. This situation is what makes more and more people in the post-modern era like it is today begin to pay more attention to this style of living room. What elements have to be included in the design of a rustic living room? Not light but dark is the color scheme of the walls of a living room if you want to make it look rustic. It is quite interesting because it is contradictory to the most common wall color schemes of living rooms as suggested by experts. It is not without a reason to choose dark, exactly textured dark, due to the fact that darker colors can make the atmosphere feel cooler and more natural all at once. As for the recommended type of fireplace, it is sure that a traditional stone fireplace is the most appropriate one in accordance with the very nature of a rustic living room. - and, woodblocks to set up parquet flooring. Wood as the material of the flooring is understandable when it comes to making a living room look rustic. A rustic style cannot be just separated from natural materials like wood. Hence, parquet flooring would be a nice choice. Now, it is clearer about this living room style, isn’t it?